Reported by : Ashish Kumar Thakur(PSE NGP+CHP) Site visit : 26th Nov,14 Location : Gouri-1 Customer : Avtar & Co.
5 DETAILED REPORT ON COMPLAINT CUSTOMER/DRIVER COMPLAINTPOINT OF ERRUPTION OF SYMPTOMS OCCURENCES OF SYMPTOMS STATUS OF VEHICLE * Driver complained for excessive steering wobbling & excess of vibration causing un-stability of vehicle together with driver fatigue. Symptoms are erupted when ever vehicle passes over un-even road surface, even minor undulation, pot holes or stony surfaces. Actual road conditions – satisfactory. 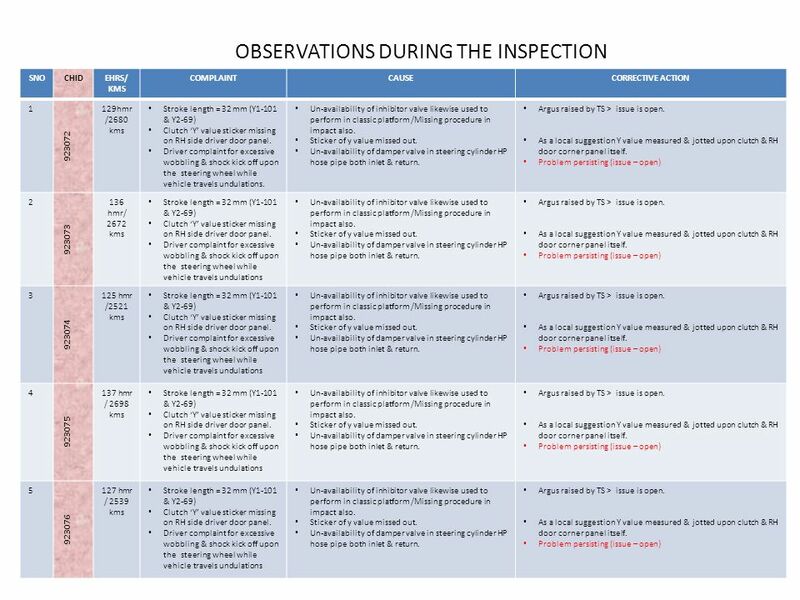 Type of material – OB Gradient – 1:16 Eruption of symptom – both in laden & un-laden condition Each & every trips (loading to un-loading point ) With lead of 6km’s(up+ down) CHID- 923072/923073/923074/923075/923076 – wobbling is evident but vehicle still running. 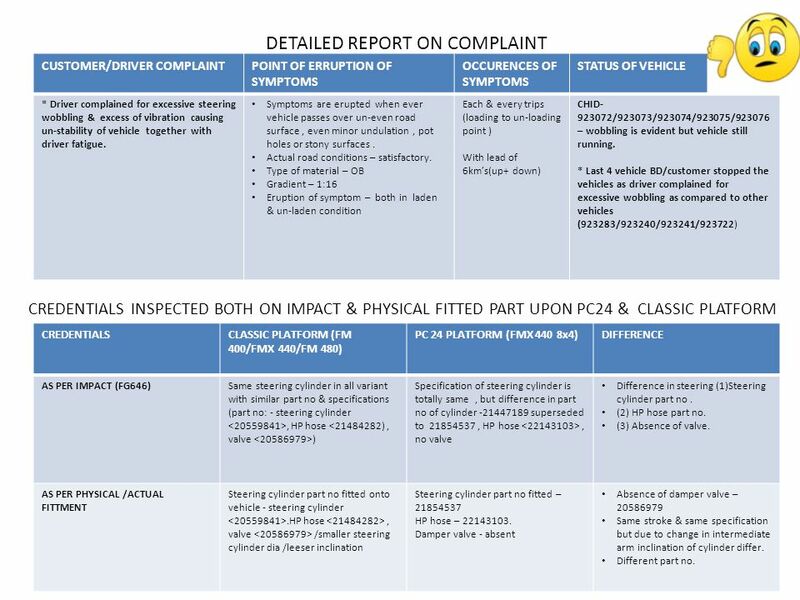 * Last 4 vehicle BD/customer stopped the vehicles as driver complained for excessive wobbling as compared to other vehicles (923283/923240/923241/923722) CREDENTIALS INSPECTED BOTH ON IMPACT & PHYSICAL FITTED PART UPON PC24 & CLASSIC PLATFORM CREDENTIALSCLASSIC PLATFORM (FM 400/FMX 440/FM 480) PC 24 PLATFORM (FMX 440 8x4)DIFFERENCE AS PER IMPACT (FG646)Same steering cylinder in all variant with similar part no & specifications (part no: - steering cylinder, HP hose ) Specification of steering cylinder is totally same, but difference in part no of cylinder -21447189 superseded to 21854537, HP hose, no valve Difference in steering (1)Steering cylinder part no. (2) HP hose part no. (3) Absence of valve. AS PER PHYSICAL /ACTUAL FITTMENT Steering cylinder part no fitted onto vehicle - steering cylinder.HP hose, valve /smaller steering cylinder dia /leeser inclination Steering cylinder part no fitted – 21854537 HP hose – 22143103. 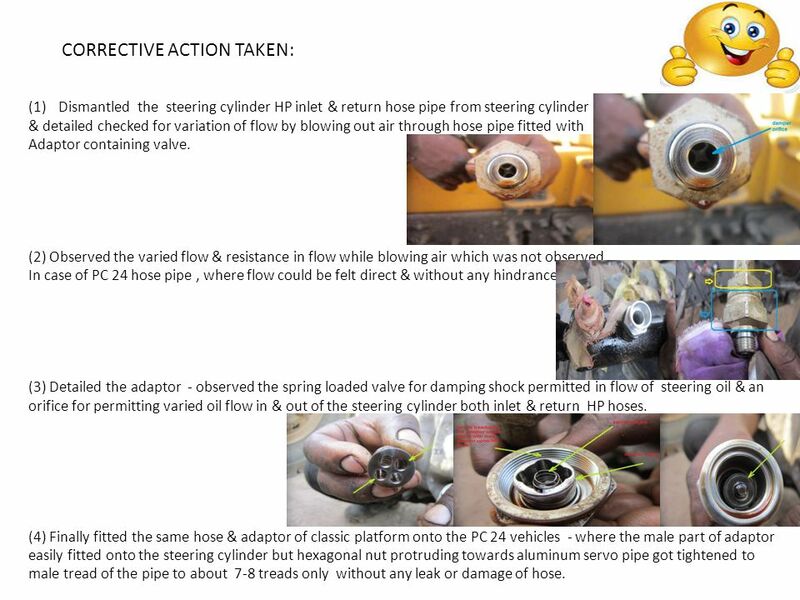 Damper valve - absent Absence of damper valve – 20586979 Same stroke & same specification but due to change in intermediate arm inclination of cylinder differ. Different part no. 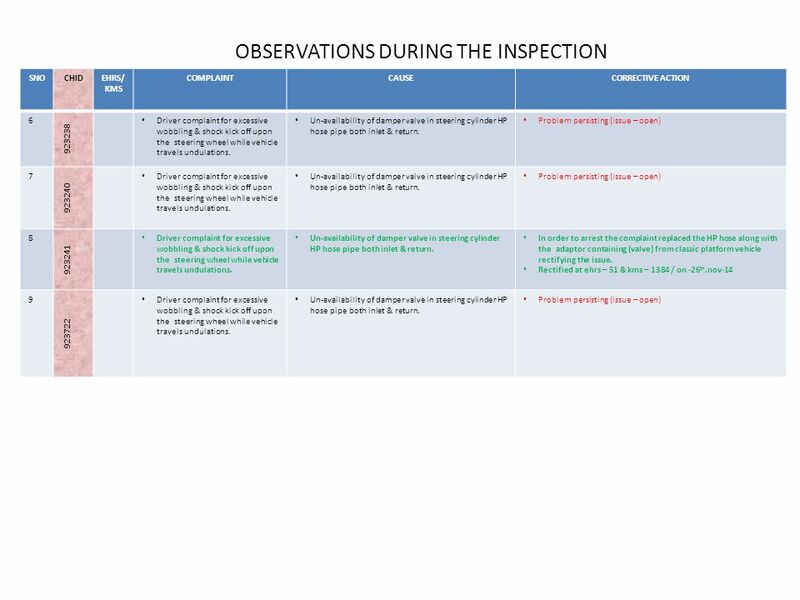 7 CORRECTIVE ACTION TAKEN: (1)Dismantled the steering cylinder HP inlet & return hose pipe from steering cylinder & detailed checked for variation of flow by blowing out air through hose pipe fitted with Adaptor containing valve. (2) Observed the varied flow & resistance in flow while blowing air which was not observed In case of PC 24 hose pipe, where flow could be felt direct & without any hindrance. 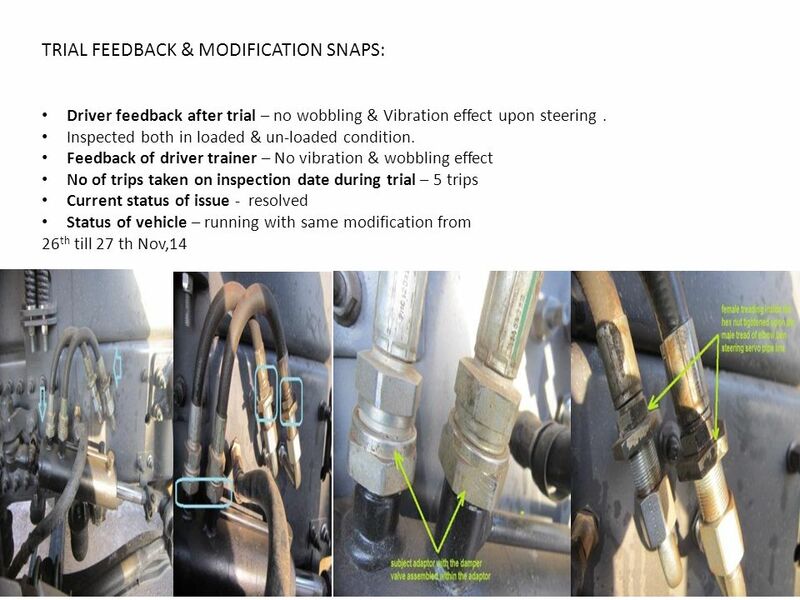 (3) Detailed the adaptor - observed the spring loaded valve for damping shock permitted in flow of steering oil & an orifice for permitting varied oil flow in & out of the steering cylinder both inlet & return HP hoses. (4) Finally fitted the same hose & adaptor of classic platform onto the PC 24 vehicles - where the male part of adaptor easily fitted onto the steering cylinder but hexagonal nut protruding towards aluminum servo pipe got tightened to male tread of the pipe to about 7-8 treads only without any leak or damage of hose. 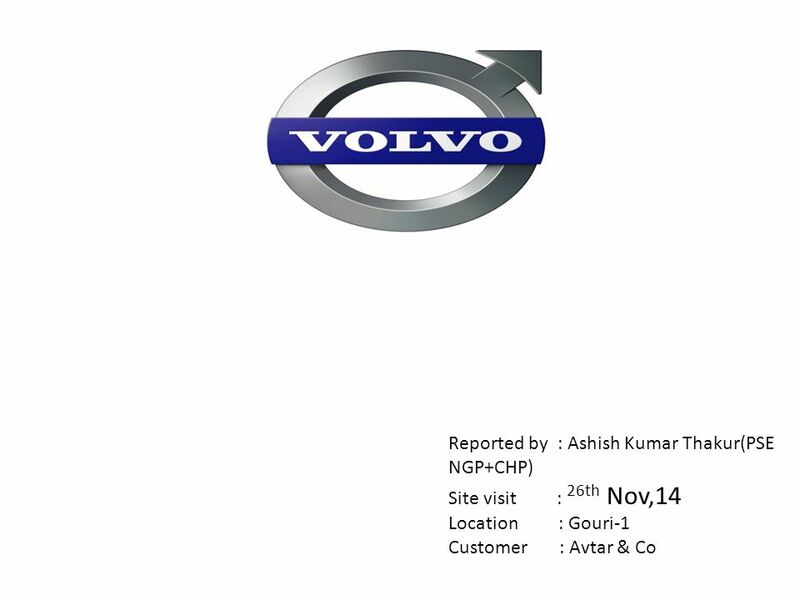 Download ppt "Reported by : Ashish Kumar Thakur(PSE NGP+CHP) Site visit : 26th Nov,14 Location : Gouri-1 Customer : Avtar & Co."
Suspension System Diagnosis and Repair. 2013 NATEF Task Area A-4 Suspension, Steering, Alignment A. 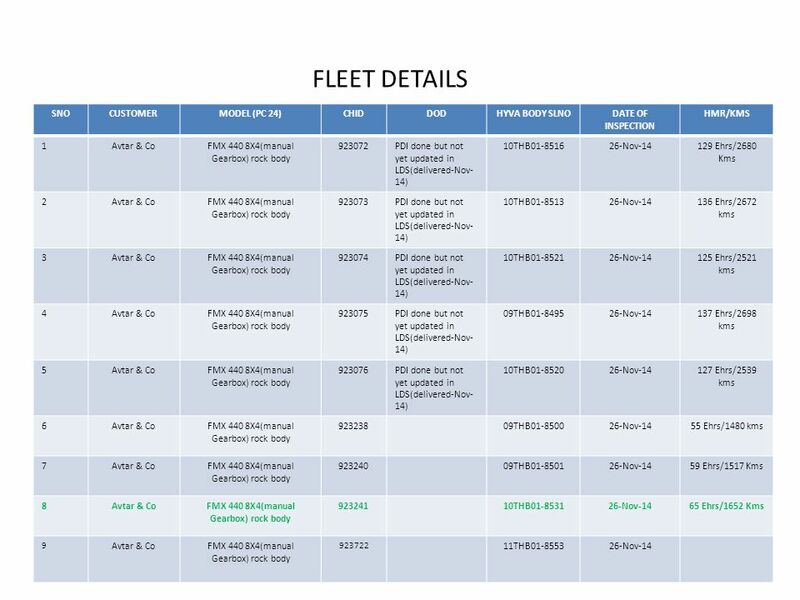 Steering System Diagnosis & Repair B. 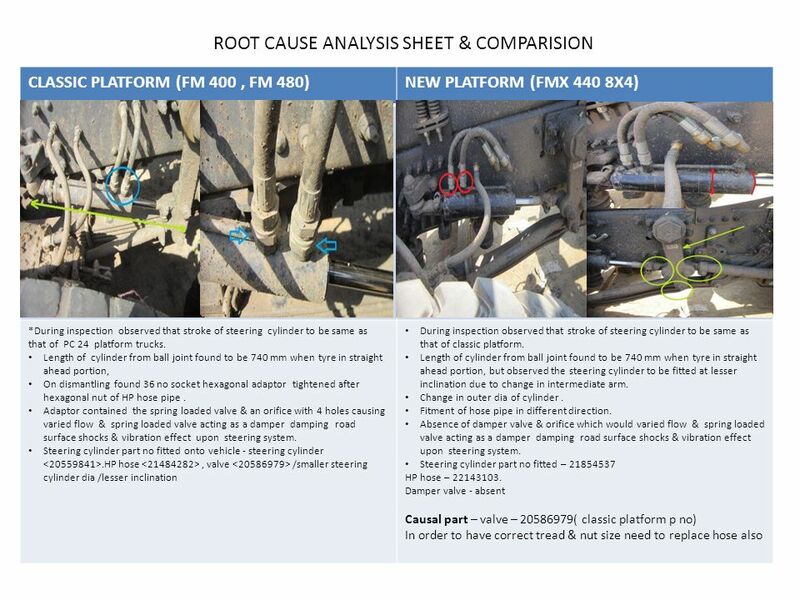 Suspension System Diagnosis & Repair C. Wheel. Common Faults - Machinery Cover missing or not fitted correctly Action : replace or refit covers Nuts or bolts missing from covers Action : replace Seals. Essential reading: SPINČIĆ, A., PRITCHARD, B, An English Textbook For Marine Engineers 2, Pomorski fakultet, Rijeka LUZER, J., SPINČIĆ, A., Gramatička. Pneumatic Tools. Pneumatic Tools are run by compressed air They greatly speed up your work They can be dangerous to you and the equipment you are working. Morgan City Rentals Diesel Jet Pump 6 x 6 Peerless Safe Operating Practices and Procedures. Introducing…. Zafety Lug Lock ® Wheel Nut Security System. Introducing…. Zafety Lug Lock™.  Revolutionary new safety product  Setting new standards in wheel management  Helps prevent lug nut loosening  Reduces. Hydraulic Brake Control Valves Automotive Mechanics Technology Walla Walla Community College.